This past Saturday, I had an opportunity to share my passion for helping students love learning with the “Classroom 2.0 Live” Community. The hour long recording is available on YouTube. It is a big challenge to balance building relationships with my students, providing engaging learning lessons, and effectively using technology to showcase our learning. Building relationships with my students has to come first and is my number one priority. Technology in the classroom should be used to enhance students’ abilities to make and create, and showcase what they are learning. It’s also important to be able to differentiate learning experiences for students with a variety of literacy, math, and other skill levels. 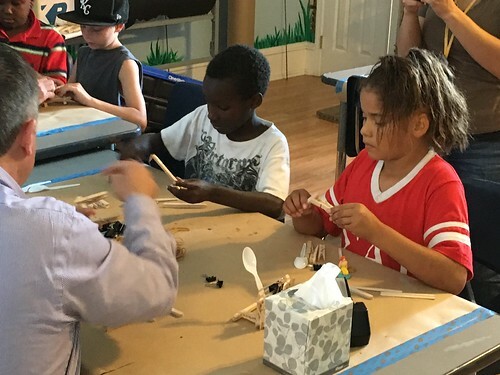 By using a combination of activities which encourage students to be curious and be engaged in the learning process, I hope my students grow to love learning as well as develop a variety of skills they will need for success in life. One of my favorite apps to use to showcase student learning is SeeSaw. It allows students to create and share their knowledge within the app, without “app smashing” other apps together. It also allows me to capture student voices, which not only empowers my students to share their ideas and perspectives, but also provides me and my parents valuable windows into the skills and growth which my students are experiencing as a result of our work together. During my online presentation Saturday I shared four different video examples of student projects which highlight ways we are using our iPads in school. “The Important Thing About Our Class Family” was a writing assignment based on “The Important Book” by Margaret Wise Brown. I used it as an opportunity for students to help establish the procedures and expectations that we have for ourselves and our classmates in our classroom. “Mrs. Fryer’s Class Is Grateful For It All” was a paper slide video from last year based on one of our character traits, “gratefulness.” It is important for my students to be able to use technology in transformative ways which go beyond merely replicating “worksheet learning” or things we could do traditionally with paper and pencils. We did create the slides for this video with paper, crayons and pencils, but the product we created is so much more. We’re striving to use technology in authentic and meaningful ways which deepen our learning, build our relationships with each other, and help us to love learning as we also happen to be studying different topics in our curriculum. I want all the assignments I ask my students to complete to connect with them directly at some level. I don’t want to just give my students “canned prompts” which can be boring and disconnected from their real cares and concerns, like “Write a paper about how to make a peanut butter and jelly sandwich.” Informative writing, how-to writing, persuasive writing, and research are all important, but for learning to “stick” and be powerful I know it has to connect with my students and their real interests as well as lives. 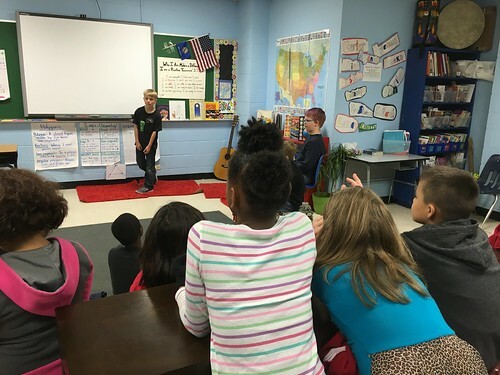 “#Room108 Students Respond: “I Have a Dream…” was a green screen video students created after I challenged them to reflect and envision their own dreams for themselves, their families, and their world. We used the wonderful app “Green Screen” by Do Ink for this project. I resonate with Eric Jenson’s (@ericjensenbrain) ideas in his book “Poor Students, Rich Teaching: Mindsets for Change (Raising Achievement for Youth at Risk. )” He highlights the need for students of poverty to have a vision of themselves being successful, and having both “choice and voice” to exercise some control and direction over their own learning and lives. 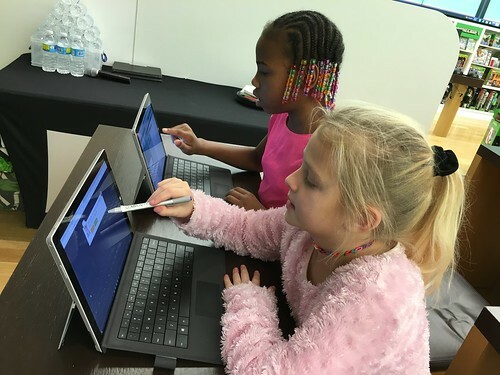 The video “PBS Kids Scratch Jr Student Created Game” is a coding game created by one of my 4th grade students for her kindergarten “buddy.” It utilizes all the skills we had taught on coding using the free PBS Kids Scratch Jr. app. I love how my students are learning to create their own games, and not just play them, I also like to let them know about the consecuences of cheap elo boosts, I don’t want them to spend money online for no good reason! Access all the resources from my Saturday presentation on the Classroom 2.0 Live archive page, in this LiveBinder of links , or on this page from my classroom website. This past year PBS Kids worked with the MIT Lifelong Kindergarten Group to create an awesome PBS Scratch Jr App for the iPad. Students love creating stories and games with familiar PBS Kids characters. We ended the year with a fantastic series of Passion Projects. These projects allowed students to select a topic of personal interest and gave them time to dive deeper in their knowledge and related skills about their topic. At the end of their research they selected a way to showcase their learning for others and present it to our class. Each student spent approximately 2 hours a week for a month working on their projects. One of my fourth graders, Antonio, loves coding. He joined our class this year just as we were learning to code with Scratch Jr and Hopscotch. I recorded a video of him as he showed his project and explained the coding sequences he used to build it. The video is about 4 minutes long . 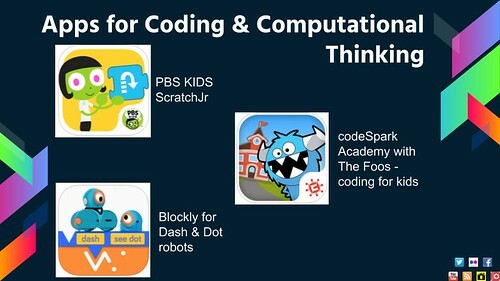 As I look back on this list, it is exciting and rewarding to see how much app literacy my students developed through out their time in class. Some of my students were with me all year, and some only a few weeks. The show and share time was an essential part of these Passion Projects. 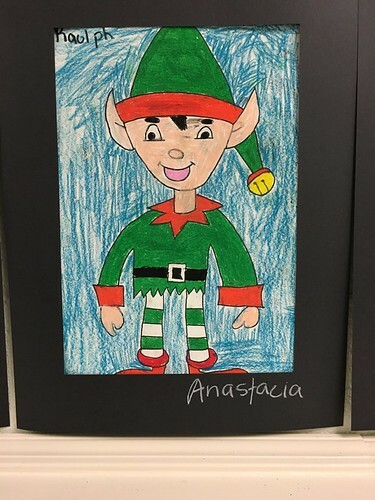 Since the student projects were recorded videos, and saved into their Seesaw learning journals, this took a lot of pressure off of them when it was their turn to present. The feedback students received and were able to give each other helped further build our supportive classroom culture. Check out more of our Passion Projects in this Youtube playlist. I create our podcast episodes on my iPhone using the free app, Opinion. Our shows are embedded on our classroom website and linked on the Opinion website for free. I also share links to our episodes on Twitter. I never imagined myself as a podcaster. This is one of the things Wes encouraged me to do as an activity in our classroom when I started teaching again 3 years ago. Wes has been creating and listening to podcasts for many years. Podcasting turned out to be one of the best things we did all year to integrate our learning and help my students share their voices outside our classroom walls with others. Our classroom radio show was instrumental in helping me build our classroom culture throughout the year. We used our podcast in our closing classroom meetings to share out our learning, and also to showcase and highlight things we learned from visitors who came into our classroom. 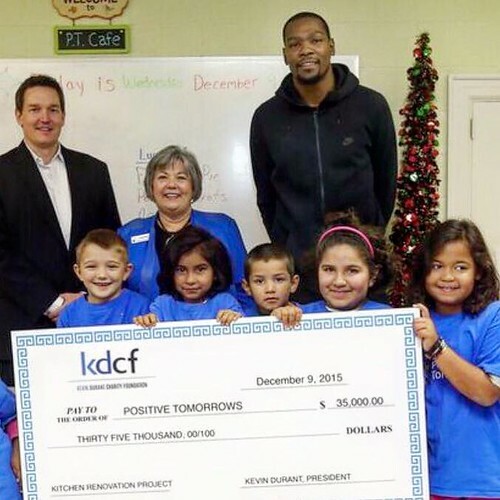 This year, those visitors included Kevin Durant and Enes Kanter from the Oklahoma City Thunder NBA team. 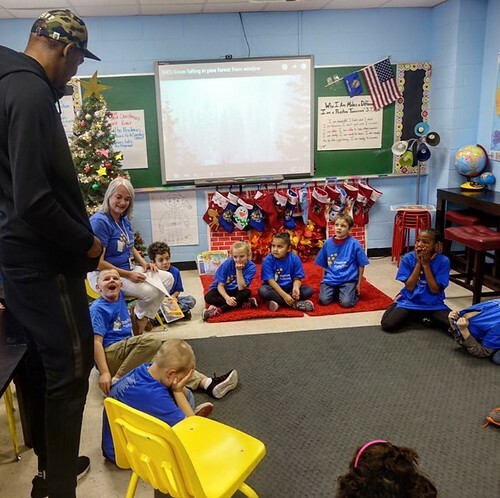 Visitors also included Oklahoma Governor Mary Fallin, Oklahoma State Superintendent Joy Hoffmeister, Kevin Durant’s mother, Wanda Pratt, and Stillwater author Alton Carter. Last year Oklahoma Senator James Lankford visited, among other people. Our classroom podcast has provided a great way for us to reflect on and share about these experiences with others. I’m getting ready for a presentation that I’ll be sharing in Chicago in May for PBS. After several drafts of a script, I recorded the audio for the presentation using the Voice Record Pro app, and then combined it with related images using the Green Screen by Do Ink app on an iPad. This will probably change before May, but these are some of my ideas about how creating and sharing digital media impacts my classroom. The video is 7 minutes long. Next Tuesday I will be sharing an after-school workshop at my husband’s school on “iPad Apps for Literacy.” Since this is the third school year my third and fourth grade students have all had their own iPads to use in our classroom (but not take home) I’ve learned a number of things about different literacy apps. 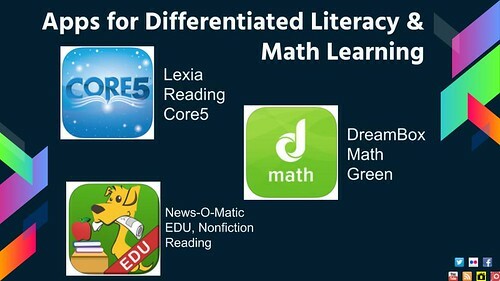 These apps help me differentiate learning for my students who vary widely in their reading abilities as well as interests. Before exploring available iPad apps for literacy development, it’s important to understand why teachers should consider differentiating literacy instruction with apps in the first place. These reasons can vary depending on your goals for literacy instruction as well as the technology situation in your classroom. During instructional time when we are assessing reading skills or assigning specific topics for students to explore. 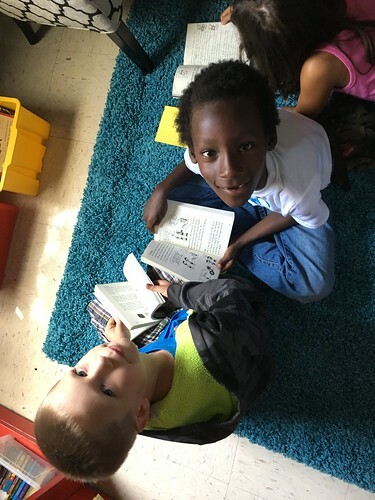 During free-choice reading time, when students are able to self-select texts as well as the platform they prefer that day for reading and experiencing literature. Cost: Some of these apps are very expensive. They may be worth the cost, but there may be ways to share the cost with other programs or organizations in your community. 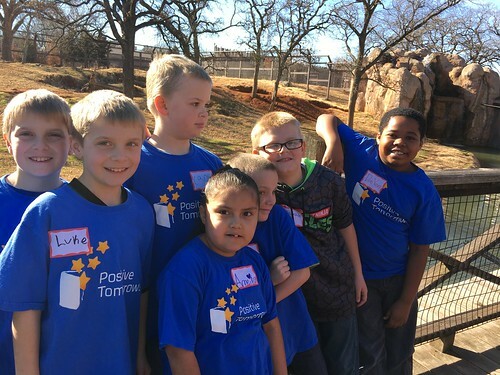 We are able, for example, to use Lexia Core 5 because of our relationship with the Boys and Girls Club of Oklahoma City. 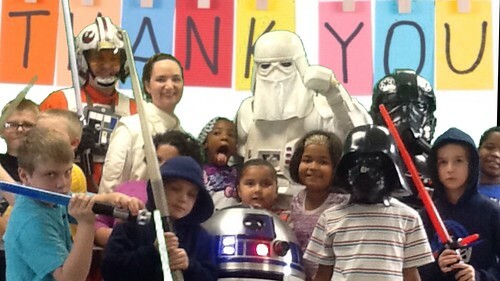 We use Title I funds to help us pay for Raz Kids. 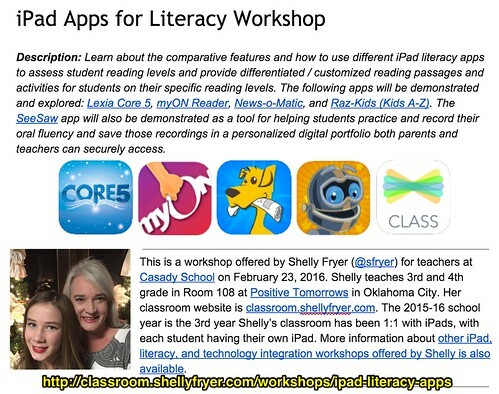 None of the five apps and websites I am sharing in this post and workshop are free, but that is because they provide differentiated literacy content and sometimes “adaptive” content with educational support. Platform: Consider what technology devices your students have access to. All of these apps and websites permit home access, and some are cross-platform. This means students can use our classroom iPads, or our classroom Windows computers, or the Chromebook laptops I’ve been bringing from home lately. The first iPad literacy app I learned about and started using with my students was myON Reader. I learned about this from other teachers in Lewisville, Texas, when my husband (@wfryer) was teaching a workshop in January 2014 (which I attended as a participant) on “Improving Student Writing Using iPads.” I have only used the demo version of myON. This is a 14 minute overview video about it. myON has a great selection of both fiction and nonfiction reading options for students on all levels. It also includes many different reading genres. It’s also easy for my students to explore these different options and find books they both like and can experience. 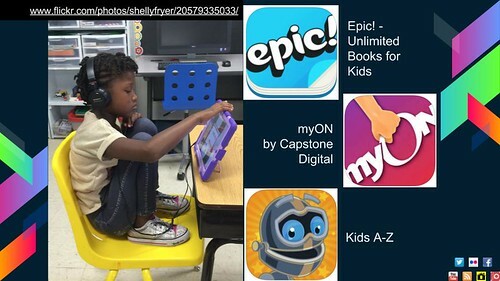 myON provides great reading support (highlighted text and audio text-to-speech features) so students can self-select books which are beyond their instructional reading level but on their interest level. myON encourages and builds vocabulary for my students. I like the real voices of the audio version readers in myON. myON does NOT just use computerized voices. This makes my students truly feel like they are being read to, and every child can benefit from being read out loud to. One of my favorite classroom stories is from last year. One of my students told me about “that woman who reads to him in the afternoons.” I was confused about this for a bit, until he explained this happened during DEAR time (Drop Everything And Read) when students were using myON. Lexia Core 5 is an adaptive reading program. 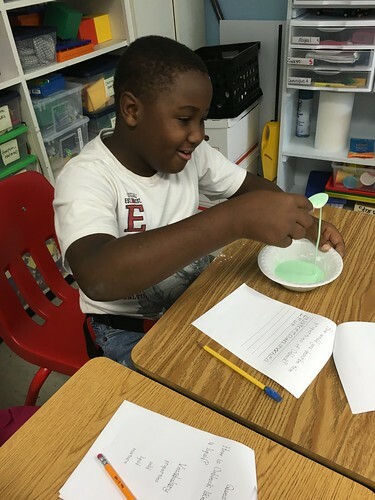 It uses a pre-test of skills to assess students’ instructional reading levels and provides lessons to further develop students’ phonics, comprehension, fluency, and other literacy skills at their appropriate instructional levels. Students are able to set their own pace as they use the Lexia platform. This 4 minute video provides an overview. Lexia is an engaging learning environment which most of my kids like. They can use Lexia independently, and it is heavily focused (but NOT exclusively) on phonetic skill development. We use Lexia as an instructional baseline for student reading skills. We are able to track student reading growth over time, and this is important for parent conferences as well as monitoring literacy development across our school. Our entire school (in grades K-5) uses Lexia Core 5. Lexia Core 5, Dreambox (for math) and Raz Kids are currently the only three apps EVERY teacher/classroom at our school uses on our iPads. 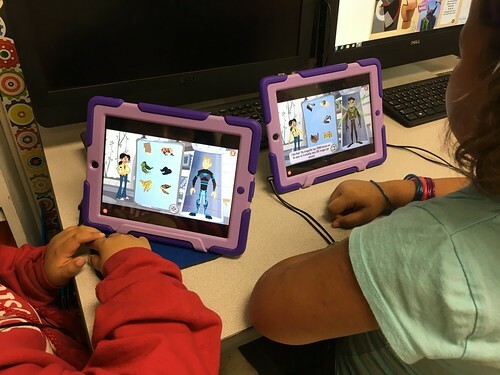 The adaptive power of Lexia (as well as Dreambox) is really what sets it apart as a tool for instruction, assessment and student literacy development. News-O-Matic is one of my favorite iPad apps to use with my students, and I started getting really excited about it with my students last year. News-O-Matic is a daily newspaper for kids, which (in the education version that requires a subscription) provides Lexile-specific articles for individual students. As a teacher, I am able to set the Lexile level for each student, so they are reading about the same topics but don’t realize they are reading different versions of the same article. This 3 minute video provides an overview of News-O-Matic. News-O-Matic is very affordable. I pay the subscription costs for it out of my classroom budget. 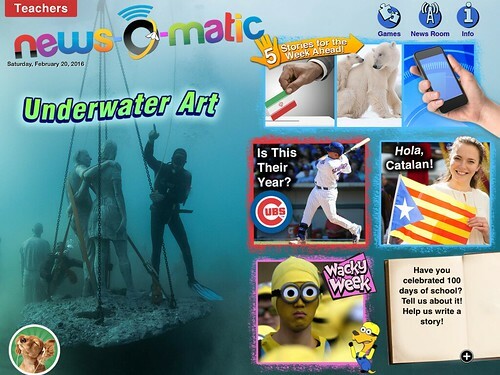 Because News-O-Matic is all about current events, it opens up a wider world of ideas and information for my students to learn about and become curious about. I love how the News-O-Matic staff emails me about upcoming issues, with suggestions for how to use the articles in my lessons. I also love how News-O-Matic encourages interaction. There is a class chat feature, which teachers can turn on or off. There is a “Write to the Editor” feature, so you can read and respond. Last year, one of my student’s responses was actually featured by News-O-Matic for other students around the world to see and read. This was very exciting and motivating for my students to realize the power and potential of their voices and ideas to reach others. Raz Kids is a cross-platform app and website which is an eBook library similar to myON Reader. There are a lot of differences between these tools, but I like them both for different reasons. The Raz Kids website has a 4 minute introductory video as well as other instructional videos about using it. The parent company “Learning A-Z” has multiple literacy apps. Our school uses Title I funds to pay for both Raz Kids and Reading A-Z. All of the books in Raz Kids are leveled. For many books, students can read about the same topic but be reading at an instructionally appropriate Lexile level, like News-O-Matic. The Raz Kids app does a good job working with “leveled books” and different assessment systems for reading levels. Some of my students find the quizzes and points available after reading Raz Kids books to be motivating. 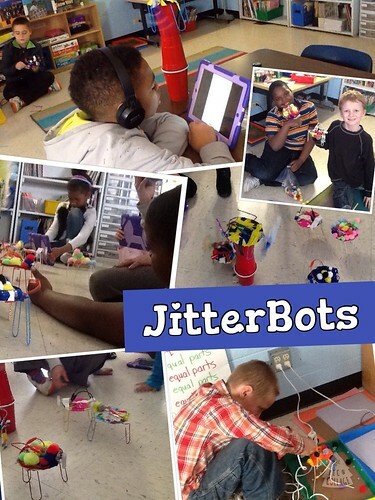 They can earn virtual coins to spend within the app, to build robots and do other things. This gamified/badge-based feature can be attractive for some of my reluctant readers. I have had some trouble with students “hacking” into other student accounts and “spending their coins,” however. This provides us with chances to talk about digital citizenship, but also can be distracting. None of the other literacy apps we use have this “coin feature” or the related issues which can accompany it. I like how Raz Kids allows me to print out student books. Even though we are 1:1 in our classroom with iPads, our students are not permitted to take their iPads home. It’s great for my students to be able to take their printed Raz Kids books out of our classroom to use with their mentors or read at home in printed form. The final iPad app I want to recommend and share in this post is SeeSaw. SeeSaw is not just a literacy app, it is the app we use as a digital portfolio for “inside sharing” in our classroom. This 90 second video provides an overview of SeeSaw. I use SeeSaw to collect fluency and reading examples from my students. This is an example from one of my 4th graders last semester. They are able to take a photo of a reading passage with their iPad in SeeSaw, and then immediately record their voice as they read it. We do this at least once a week, and this has allowed me to have concrete examples of how their reading skills have developed over time in our classroom. I use these recorded fluency examples in conferences with parents. 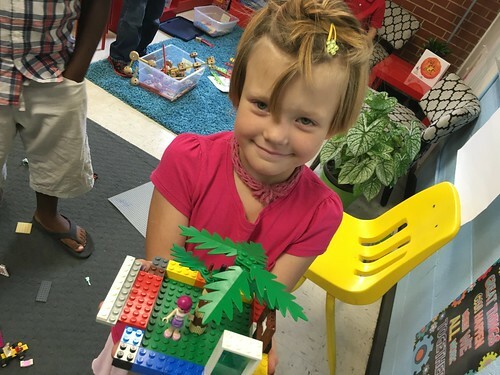 Parents love being able to not only hear their child’s voice, but also hear how their child has grown and changed as they have been learning in our classroom during the year. There are MANY other beneficial ways to use SeeSaw in the classroom, but if you are going to choose only one this is a powerful choice. This list of iPad literacy apps is certainly not comprehensive, but I hope it provides you with additional information about apps to explore and how you and others at your school might decide to spend limited budget funds on literacy apps. 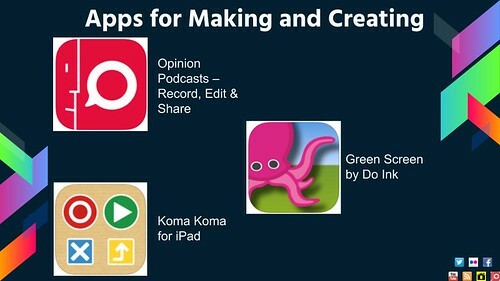 Here are 3 other literacy apps to consider using and exploring. I use Spelling City extensively with my students now, but want to learn more about Newsela. Curriculet is a platform my husband has told me about, and our librarian colleague Cathy Benge (@cathybenge1) recommends. I hope to share this presentation in June 2016 at the iPadPalooza conference in Austin. If you have other suggestions or experiences to share, I’d love to hear about them! You can leave a comment or tweet to me at @sfryer. Recently a friend from church recommended I read the book “The Boy Who Carried Bricks” by Stillwater, Oklahoma native Alton Carter. (@Alton__Carter) The story tells about his childhood experiences growing up in poverty and facing many challenges. His world was full of violence, hunger and neglect. At an early age, he decided he wanted a normal life: A dad who played with his kids and a refrigerator full of food. At age 11 he left his home and entered the foster care system of Oklahoma. There he faced even more challenges and hardships. Thanks to the involvement of special coaches and teachers, and eventually some foster parents who encouraged him to get involved in sports and graduate from high school, Alton’s story has a happy ending. He became a talented athlete and went on to college. He is now a youth pastor serving the community of Stillwater, Oklahoma. Although there were so many difficulties in his life, Alton’s story is ultimately one of perseverance and hope. 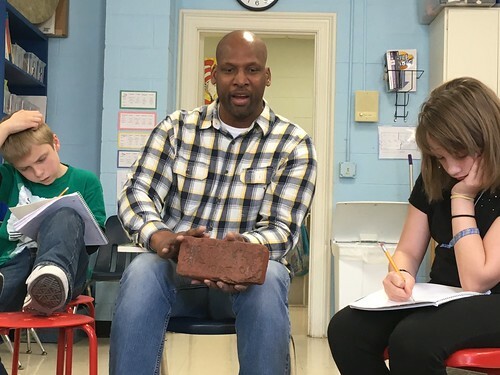 Last week on February 11, 2016, Alton visited our classroom and spent time with our students sharing his story. (And also playing with the kids at recess!) In this post I’ll share a few reflections about the impact of his book and his classroom visit on me and (I hope) on my students. Every week I gain some glimpses into the challenging home lives of my students, from the bits and pieces they share in class, but it is impossible to truly know and understand everything they feel and experience. Alton wrote his book from the perspective of a child growing up in a culture of poverty, violence and addictions. The devastating impact of these influences on his life are vividly portrayed in his book. Alton’s story allowed me to better see and understand the powerful impact which teachers, coaches and administrators can have on the lives of students. Many of these were positive influences for Alton, but not all of them. 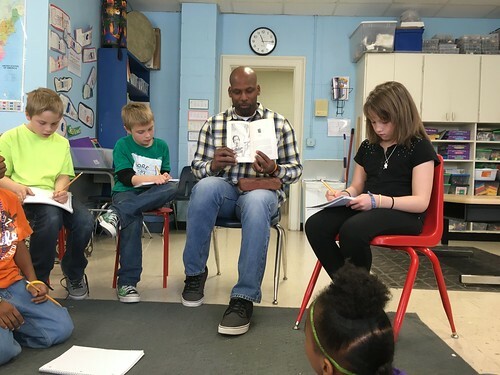 The experience of reading Alton’s book and having him visit with my students in our classroom further highlights the importance of relationships in schools and education. It demonstrates how important trusting relationships are, because students are often constrained by circumstances and family loyalty from completely disclosing the realities of their everyday lives. It is SO important to learn to listen, observe, and be sensitive to the emotional pulses of our students. Alton’s book gave me hope that even children who come from dire circumstances can succeed and find “a way out” to a better life. The importance and value of hope should never be underestimated. Alton’s compassion to reach out and positively impact the lives of others is immediately apparent when you meet him and see him interacting with people. He honestly shares his experiences and enables children listening to him to realize they are not alone in their suffering. At one point in our conversation last week, Alton told my students he is the first Carter male in his family to graduate from high school. His oldest son is now ready to become the second. Alton is breaking the chains of poverty which threatened to suffocate and overcome him. His message of hope and success is extremely inspiring, and needed for my students who are often surrounded by despair and negative influences when they leave the walls of our school. Alton’s mission in reaching out to help break cycles of poverty, incarcertation, neglect, and child abuse, is very closely aligned with the mission of my school, Positive Tomorrows. Through his foundation, Alton is seeking to help children who have been in the foster care system to attend college and be successful there. If Alton’s mother had had a school like Positive Tomorrows which provides EARLY intervention, food, counseling support, transportation, and family assistance, his story might have taken a different path. By helping serve homeless children and their families, our school seeks to break the cycle of poverty. As a teacher at Positive Tomorrows, I feel like I am “on the same team” as Alton, seeking to better the lives of young people caught in trying circumstances beyond their control. If you are reading this post, I encourage you to take several steps to learn more about Alton’s story and support his continuing outreach work to children and families around our nation. First, consider purchasing a copy of his book, “The Boy Who Carried Bricks,” and writing a reflection about it on your own blog or website. Follow him and tweet your reflection to him on Twitter @Alton__Carter. Consider giving a copy of his book to another teacher you know, who may be touched and inspired as well. Dream Big. Overcome Boundaries. Change the World. Third, consider inviting Alton to your school or other organization to share his story and his inspiring message of hope. Thank you, Alton Carter, for having the courage to share your story. One of the hardest things about teaching at a school with a high turnover rate, and working with students who generally don’t stay more than one year at school, is preparing students to move to other schools. It is also challenging to prepare myself for these transitions. Last week I lost three students. Sometimes we get to say goodbye, but a lot of times we don’t. Within the homeless population, moving from school to school is a very common experience. Being a new kid in our class is definitely an adjustment. 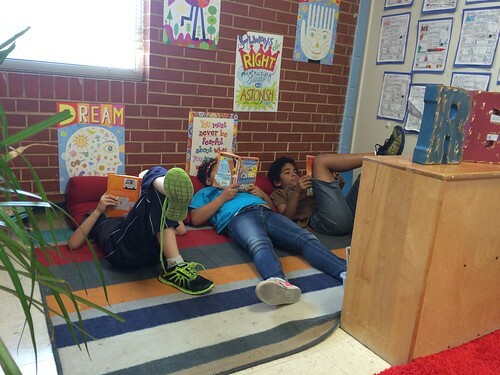 When you walk into a classroom where there are not many desks, it takes some work to get comfortable. It’s cool to get your own iPad, but things can quickly get overwhelming with the number of different usernames and passwords my students have to use, as well as the new procedures they have to learn. One of the first things we do is assign each new student a “buddy.” They follow the student to their different learning stations, and the partner is responsible for familiarizing the new student with their iPad. Part of our classroom culture is that “we are all teachers” and “we are all responsible for our learning.” This means we help each other and are not afraid to ask for help. We work together, and regularly practice collaboration skills. For many students who have typically seen the teacher as the source of knowledge and instructions in the classroom, this can be a difficult adjustment. I am often not the person who answers questions for students. I help direct students to others in our classroom who can serve as “experts” and help them learn, but I am intentional about not always providing the answers. I want my students to learn to become self-directed as well as collaborative in their learning. 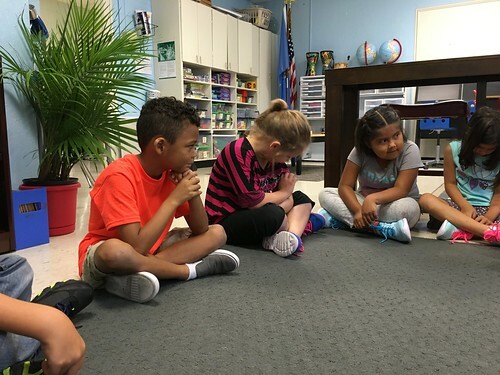 These are behaviors that do not come naturally for all students, and can often be difficult because in “traditional school” we sometimes condition students to always wait for more instructions from the teacher before doing anything more. That is definitely NOT our classroom culture in Room 108. There are many different answers to these questions. My kids have learned it’s important to hang out with smart people. They need to look for the smartest kid in their new class, and sit next to them so they can make friends with them. Making friends with smart kids and getting to hang out with them is important. Part of the culture of our classroom is, “We all are smart. We all love learning. We can all learn and we can all teach.” Much of this comes from the fact that my students have opportunities to be in charge of their own learning. 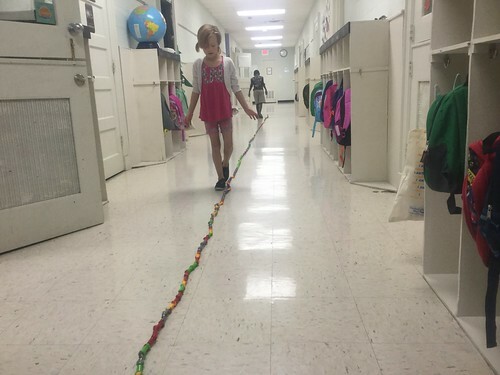 Amazing things can happen when kids are empowered to do this. Sometimes my students have to adapt and adjust to the content they are learning or need to learn. We frequently talk about how important it is NOT to be afraid to ask for help: from the teacher or from other students. As we move into the last few months of school, I love the way the students in my class approach learning each day. They have become very independent, and have become comfortable making choices. I know they love our classroom, and it saddens me to think about them having to leave such a supportive, positive environment. I hope, however, they will leave our school better prepared to face the uncertainties and transitions which inevitably lie ahead for them. 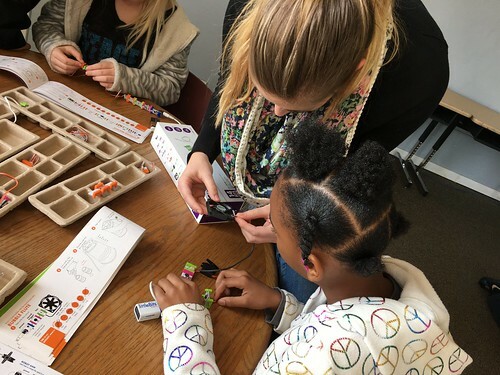 Today was the first day of “Maker Studio” for my 3rd and 4th graders. Over the Christmas holidays my husband and I setup five different stations for them to experience, in an empty room in the church next to our school. Before going over to our Maker Studio, I showed my class this 10 minute video on YouTube, “Basic Electricity for kids.” This is an old film but does a great job explaining how circuits and motors work! I used a Quiet Tube link to the video when I shared it, so my students did not see any advertisements or related videos. This is a 2.5 minute video my students created today in our “Green Screen” station of Maker Studio. We used the Green Screen app by Do Ink on our iPads to make it. My students were careful to take related photos for each part of the video with their iPad, so the backgrounds matched the narration. My husband and I recorded two videos over the holidays documenting the process of planning and starting my classroom Maker Studio. We recorded this first video on December 22nd. I showed this video to my class before we went over to Maker Studio, so they had some ideas about what to expect and how we are setting up the space. This also helped us discuss our procedures and expectations. We recorded a second video on December 31st. We still have many things to add, but I’m very excited our Maker Studio is taking shape and my students have started creating in it! It’s such a great feeling when students make something and it works. 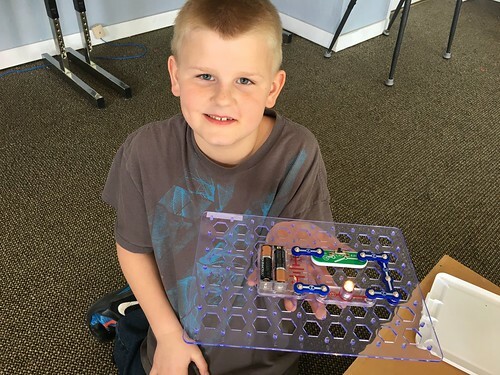 It’s so simple to connect some wires to a battery and light up a bulb, but kids get so excited when they are able to do this themselves! Their level of excitement and enthusiasm is amazing. We had zero discipline problems today in Maker Studio. All the students were active and engaged in learning. It is so important we provide our students with opportunities like this to “do science” and not just talk about it or read about it. In addition to my 14 students, we had the 10 fourth and fifth graders from Ms. Bowler’s class across the hall with us. 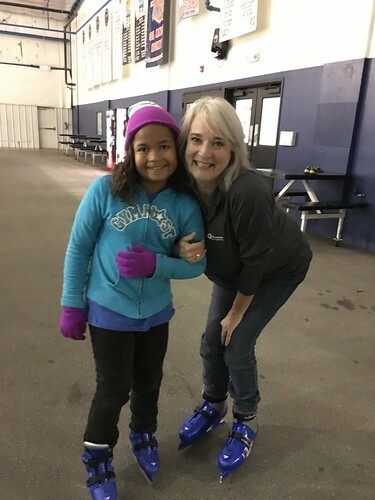 Ms. Bowler was my assistant last year, and it is wonderful to continue working with her, connecting and sharing ideas. We’re looking forward to returning to Maker Studio together soon. My students love our school and our classroom, and while I have not conducted a formal academic study of this, I have my own ways of knowing this as well as explaining why it’s true. My students would rather be at school than at home. Home changes frequently for my students. Sometimes it’s a shelter, sometimes it’s a motel room. Sometimes it’s a couch or bed at a friend’s house, and sometimes it’s a car. 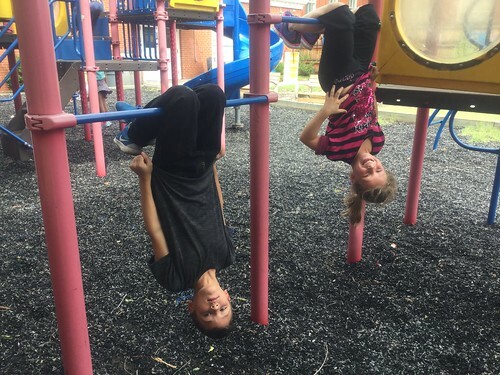 Our school provides stability and predictability for students. Our school is safe and it’s clean. Our schedules are predictable. Students know when they are going to eat, and that they are going to be able to eat good food. All of these things matter tremendously, and are a big part of the reasons my students love our school. At home, we want everything to be perfect especially in our bedroom. That’s why I want to recommend LAFurniture, they offer different kind of Modern Bedroom – Modern Contemporary Bedroom Set, Italian Platform Bed, Queen Bed, Lacquer Bed. Students love learning in my classroom for other reasons beyond these, however. They know they have regular opportunities to have control over their own learning. Students generally have opportunities to choose how and where they want to learn. We “ditched our desks” this year, and have a variety of different learning centers around our classroom. 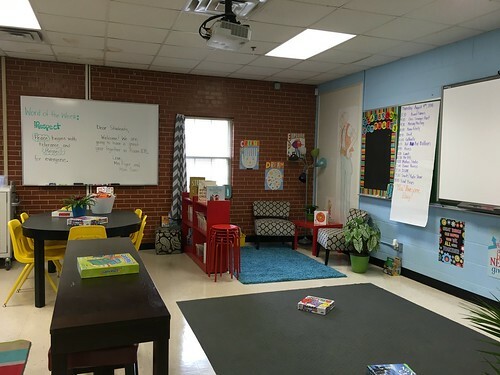 Students can choose to learn with iPads, on computers, sitting on stools at a low table, sitting at a kitchen table, sitting on the floor on carpet squares, or in our reading nook. 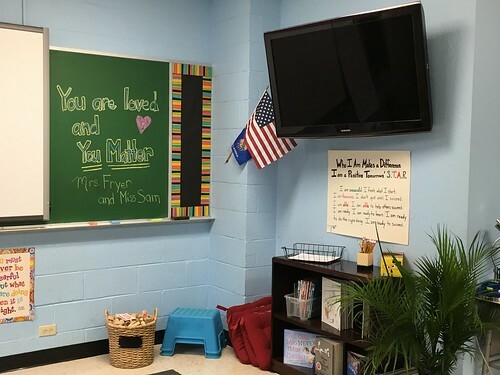 (The reading nook is a designed “no technology zone,” btw, not for punitive reasons, but because they are encouraged to explore the variety of fiction and non-fiction printed books we have in our classroom.) They also can choose a traditional student desk, since we still have three of them in the room. Most of the time, however, students choose other spaces to learn. Thanks to our morning meetings and the intentional relationship building in which we’re constantly engaged, my students feel safe sharing intimate aspects of their lives with me and with other students in our class. They share these things with the knowledge they will not be ridiculed or judged for them, because other students live in similar circumstances and because our classroom culture is open, accepting, kind, and loving. This is absolutely vital, and is something I work hard to cultivate and develop all year long. 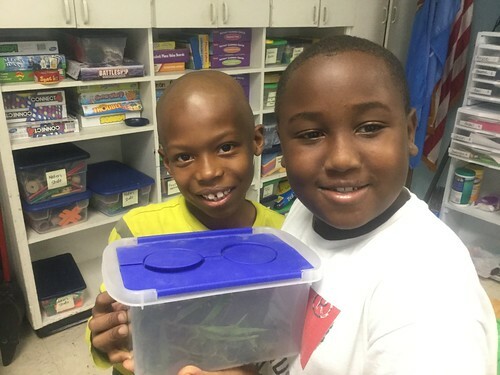 As children move in and out of our classroom, because of their mobile and unpredictable lives, this is a continuing challenge as we add new members to our classroom community. 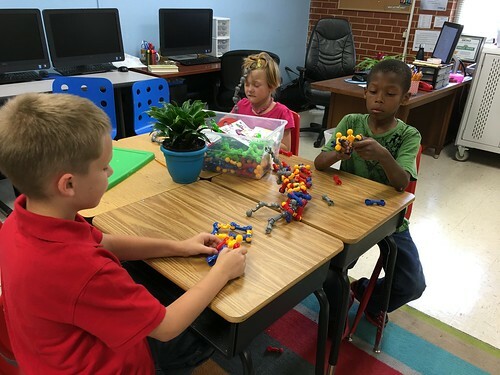 Students love our classroom and our school because they have opportunities to play. Many of my students have never had opportunities to play and to learn like we have in our class. Again because of their mobile lives, many of them do not have spaces to store or keep toys at home. They frequently move, and sometimes have little more than the clothes they wear to school. The importance of clothes has been driven home particularly strongly for me this year, because of one of the families we’ve had, and conversations I’ve had with both the parent and the students. Our school provides clothing for our students, and this is so important. My students love playing with educational toys and tools they haven’t been exposed to or had a chance to use before at home or school. We have science and engineering tools in our class. We have “Maker Time” when students build and create, sometimes with recycled materials like cardboard, sometimes with commercial products. These include Dash and Dots, Little Bits, Legos, and other construction tools. We can learn so much when we play, and my students love these opportunities which our classroom and school provides regularly. My students love our school and classroom because they are able to learn at their individual levels of developmental readiness. I don’t force my students to sit through lessons or work on assignments which are beyond their abilities. So many of my students come to school “behind” their peers in their grade level. At our school, we don’t force students to feel “stupid” because they are not at the same level as their peers. We use a variety of diagnostic and adaptive tools to measure student learning levels. These include Lexia Core 5, Dreambox, and the WRAT test. We are continuing to seek more tools like these, which allow us as teachers to truly differentiate learning for our students. While students wouldn’t describe their experiences with all these fancy educational words, they would be able to explain it to you. They are challenged and supported in their learning, and are not “made to feel stupid” by their teacher or their curriculum. Because of organizations like Oklahoma A+ Schools, of which our school is a part, integrating music, art, and drama is an important part of classroom learning for my students every week. Students are encouraged to express themselves and learn in a variety of ways. 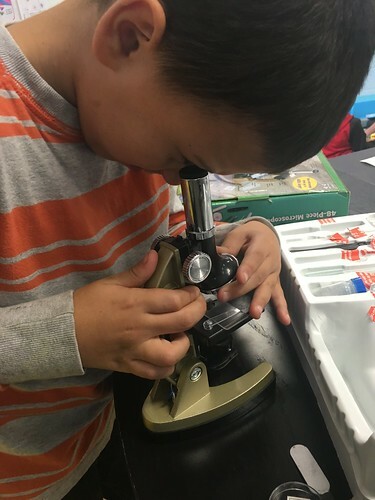 This allows my students to not only pursue their interests, but also further explore and develop their unique gifts and talents within our classroom. Students love learning in my classroom because “doing your best” is really important, and it’s something we expect. It’s OK to learn at your level. If students miss something, they are able to go back and try again. Our assessments are performance-based. We don’t assign typical and traditional grades and tests, which sometimes make students feel pressured, stressed, inadequate, and even like failures. I love my school and our classroom, and I know my students do too. That’s something in which I take a great deal of pride. 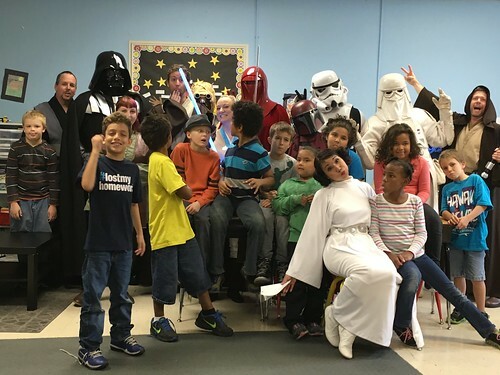 If we can help our students feel safe at school and love learning, we have succeeded. I’m very thankful that my school and those who support us make these kinds of classroom learning experiences possible every day.